I recently read The Mind in the Cave: Consciousness and the Origins of Art, the first of a trio of books written by David Lewis-Williams, Professor Emeritus and Senior Mentor in the Rock Art Research Institute at the University of Witwatersrand in Johannesburg South Africa. Not only do these books describe and compare prehistoric art forms and practices from varied cultures, they also present a scientifically plausible and intriguing context for why these ancient works were created by early Homo sapiens. It’s widely believed that prehistoric cave paintings, presented in darkened, cavernous environments, were meant to inspire awe and reverence and this is still the case today. Who hasn’t been awe-struck after viewing the cave paintings from Lascaux, Altimira or the most recently discovered Chauvet caves? Picasso is often quoted as having said, “After Altimira, all is decadence.” Though this statement has never been substantiated, we can all relate to its intent. I have never had the good fortune to visit any of these caves myself (now many closed to the public), so I asked artist, Norine Spurling, about her impressions having visited over twenty caves in 1988 with a group from Princeton University. She was gracious enough to share some of her thoughts with me. This is an excerpt from her notes, written in the dark, upon entering Niaux Cave in the Ariege region of southern France. Very long walk into unprepared floor through very narrow low openings. Rocky floor, puddles – some very large. Symbols on right side; red dots, black dots, vertical lines arranged in very specific ways. Up a wide bank into a large domed cavern, very high, very wide. Wide curved niches on the right side with paintings. Large bison facing each other; very small Ibexes, very small horses, large horse, one deer. Bison – red dot in front of front leg. Some arrow-like marks. Horse drawn with winter coat; Ibex with rings on horns. As we moved into the large cavern, lights [were] taken away from us. [We] moved into the center of this great, vaulting space, Lali spoke, her voice echoed against the dome. My knees were cut out from under me. Emotions bubbled…. [in a ] kind of holy resonance. As we moved to the large panel, I came as close as I could and crouched and sat on the floor in awe and intoxication. [I] had to kneel or crouch, bow down, in this ancient holy place. Ancient peoples must have felt the need to mark this soul stirring mystical experience by some means. Mere symbols not enough – it requires a place, a visual metaphor, a ritual, none of which match the original experience but manage somehow to call up a memory of it. The description of the entrance to Niaux in The Mind in the Cave is remarkably similar to the description by Norine Spurling. At the time of her trip in 1988, it was thought that such cave paintings dated back only as far as 10,000-15000 years ago. 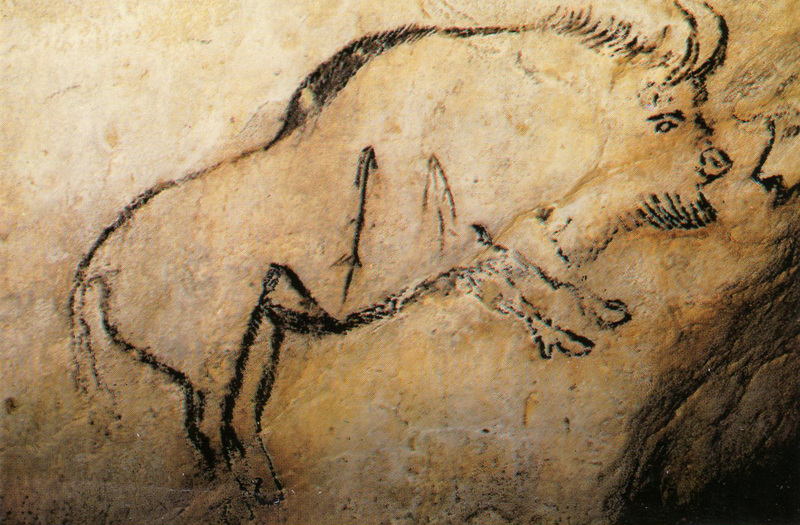 It was only a short six years later in 1994 when the cave paintings in the Chauvet caves were discovered and dated to about 32,000 years ago. This was much earlier than anyone thought this type of imagery might have been created and gives a broad hint that humankind has been using imagery for a very, very long time. In his books, Lewis-Williams contends that these images, as well as other prehistoric works, were created as attempts by our ancestors to make sense of their dreams and altered states of consciousness. He goes further to posit that similar, iconic geometric images that are seen in different prehistoric cultures around the world came from deep within the human mind. This is due to hard-wired neurophysiology, in which various levels of altered states generate similar geometric shapes in all humans as well as similar experiences of vortex-like tunnels sometimes followed by similar visionary hallucinations. However, the interpretations of these visions differ in their final form based on the cultural context of the individual experiencing them. For example, perception of the visions experienced by Hildegard von Bingen, a Christian mystic from the 12 century, differ greatly from the images based on beliefs in animal spirits that more than likely inspired the European cave painters of the Upper Paleoloithic between 10,000 to 40,000 years ago. However, shared, iconic geometric images have been documented in the field of Neuroscience and Lewis-Williams references some of this research data to support his conclusions. This is a reminder about what a remarkable time we live in, in terms of discovering and understanding our human origins. This is not only now possible because of the technological age we live in but it’s also because of our current perceptions about our own evolutionary past. These developments are very recent within the context of our emergence as a species which science dates to about two-hundred thousand years ago. Darwin’s theories were published less than two-hundred years ago. 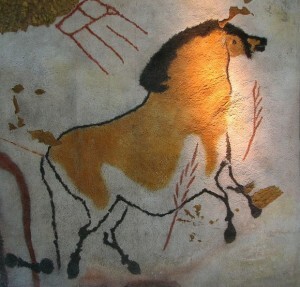 The recognition that the now famous cave paintings in France and Spain were, in fact, created by our prehistoric ancestors was not verified until a scant one hundred years ago. These represent mere seconds within our historical timeline on this planet. Though science can be used to gain a better understanding of some prehistoric art, throughout his books, Lewis-Williams links the creation of most prehistoric art to a combination of animal spirit worship, shamanism and altered states of consciousness across diverse cultures. These are also recurring themes in most theories behind the origins of these images within the fields of anthropology and cognitive archeology. Though any interpretation remains open to debate because there is no written record to definitively prove any theory, it’s hard to argue with some of these ideas because of the emotional impact these images still have on us today. In his following books, Inside the Neolithic Mind and Conceiving God: The Cognitive Origin and Evolution of Religion, Lewis-Williams elaborates on ideas introduced in The Mind in the Cave and how creation of prehistoric imagery, along with ritualistic activities, formed a basis for early religious practices with the eventual formation of social stratification. If you are interested in reading these books, it it best to start with the The Mind in the Cave as both later books build on that one. I found them all fascinating to one degree or another. They are all written for the interested layperson but with strong academic over tones. So, be prepared for some challenges. While reading these books I also viewed Herzog’s Cave of Forgotten Dreams, his recent documentary on the Chauvet Caves (beautiful but I could have lived without the albino crocodile ending); and Visions, Margarethe Von Trotta’s biopic of Hildegard von Bingen, the medieval, Christian mystic. A fascinating film about a fascinating woman. Lewis-Williams references Hildegard in his last book. Both films are now streaming on Netflix.